CRUDE OIL (futures): Although Crude Oil is now lagging behind Gold in terms of upside offensive and continuation of its medium term uptrend, from the big picture perspective, the commodity’s chart is healthy and looks to activate that trend on ending its current consolidation. Crude Oil had in July 2008 lost momentum after hitting its all time high at 147.24 and collapsed sharply lower for the following six months before finally bottoming at 35.66 in early Feb’09. That bottoming process culminated in a full-blown rally after decisively violating the 50.44 level, its Jan’09 high pushing to a high of 81.95 in late Oct’09. This came on the back of prolonged triangle pattern consolidation which finally resolved higher on Oct 14’09. The commodity is now consolidating above the mentioned triangle assuming a role reversal rule in technical analysis. Our bias remains to the upside medium term while holding above its invalidated triangle and its long term trendlineinitiated at the 35.66 level. Immediate upside risk is seen towards the 81.02 level where a clean break will turn focus to the 81.95 level. This level serves as a trigger for the resumption of its medium term uptrend with a break through there paving the way for a run at its 200 emaat 85.30.A loss of there will set Crude Oil up for a move towards its .50 Ret(147.24-35.50 declines). To the downside, initial support resides at the 76.53 level, its Nov 03’09 low ahead of its Aug’09 high/horizontal trendlineat 74.93 where a reversal of roles ahead of its triangle pattern congestion highs is expected. 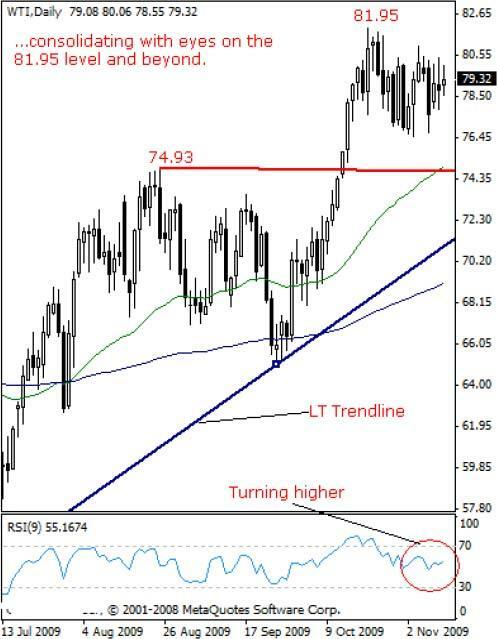 Further down, its LT rising trendlinestanding the 71.23 level will be targeted. On the whole, with its major emaspointing higher and its LT rising trendlineremaining intact, threats remain higher for the resumption of medium term uptrend now on hold.